Sometimes we get to the gym and we’re tired or sleepy. It happens to everyone once in a while, which is completely normal. However, if you constantly have low energy levels at the gym and it’s starting to affect your training, then you may need to look deeper into the possible reasons why this may be the case. This way, you can fix it and get back to training hard. One of the most obvious culprits of your tiredness is not getting enough sleep. While we all may have bad nights, if you are consistently getting fewer hours of sleep than you should be, then this will start to greatly affect you in your day-to-day life, including the gym. Not only will this mean that you will be too fatigued to lift as heavy as you should be, or be running as long or as fast as you could, but you won’t be recovering properly. Your muscles break down during training, and it is actually when you are resting that it begins to repair itself. Without adequate sleep, you are not giving your body the chance to heal. Not only will this stall your progress but you will also increase the risk of injury. You need food to fuel yourself for the gym. With the exception of those who train fasted*, most people need healthy food to help give them the energy for training. If you are too tired at the gym, then you may need to up your food intake, or adjust what you eat for better results. For example, if you are training within a few hours, then a bigger meal with slow-releasing carbohydrates is best. If you are training within an hour or less, then go for a quick snack with fast-releasing carbs so that you can get energy faster. Just think of your body like a car. Without fuel, the car won’t be able to drive for long. Once it runs out, it will splutter and eventually run out of steam. This is exactly the same with your body. Without the nutrients from food it needs, you will also eventually run out of energy. And when you’re in the gym, this will become painfully obvious. *If you do train fasted as well, make sure that you eat a well-balanced dinner with plenty of protein that will sustain you until after your workout. One common mistake that people make is overtraining. This is when you train too much at the gym, to the point that it begins to be detrimental to your physical progress as well as your mental state. If you find that you have experienced some of these signs, then give your body the rest that it desperately needs. Take a day or two off from the gym, and see how your energy levels fare when you come back. You should feel much more energized, motivated, and ready to tackle training. Just be sure that you include rest/recovery days into your normal gym schedule. This can make sure that you are consistently working out hard, without risking your body to do so. We all know that water is so, so important. You need to be constantly replenishing your fluids so that you stay hydrated. Losing water means that you’ll also be losing electrolytes, which is essential to your muscles during a workout. If you start to become dehydrated, this could be one of the reasons why you have such low energy levels at the gym. So make sure that you keep drinking water not only throughout your workout but also before and after it. You know if you’re dehydrated if your urine is more yellow than clear. If that’s the case, then drink up! Have you found that your energy levels are constantly low when you’re at the gym? Make sure that you look after yourself, and that you’re resting and sleeping enough. Also, focus on your diet and ensure you’re eating what you should be most of the time (but don’t forget to treat yourself in moderation!). Making these changes can really help amp up your energy levels at the gym and make sure that every training session is a great one. 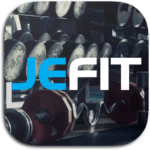 Jefit is a fitness app that comes equipped with a customizable workout planner, training log, as well as a members-only Facebook group. Connect with like-minded people, share tips, advice, and wins, to get you closer to your fitness goals today. Have you ever had low energy levels at the gym? Why is that so? What helped you fix this? We would love to know! Let us know in the comments below!